Don’t let stress keep you from making a greater difference in the lives of your students. Teaching is tough. I know. I was a teacher for over 20 years, and I understand how easy it is to get discouraged and stressed out. As any teacher who has been teaching for a while will tell you, there are times when the days are long, and the stress can rob us of our joy. As a result, we’re not at our best, and our kids suffer. Are you nodding your head? You’ve had those days. Right? I’ve seen many a teacher enter the profession enthusiastically and ready to save the world, and then as the demands of the job increase and reality fails to meet their expectations, they become sour and burn out. 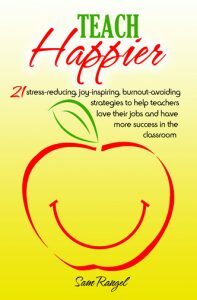 I am so excited to announce that my latest book, Teach Happier – 21 stress-reducing, joy-inspiring, burnout-avoiding strategies to help teachers love their jobs and have more success in the classroom, is finally published! My book offers some practical strategies that I’ve learned from experts in psychology and neuroscience to help teachers teach happier. I’ve come to understand that there are specific strategies that we can implement to not only be less stressed, but to actually bring more happiness into our lives. It has been transformational for me, and I am so excited to be able to share what I’ve learned with the people who I believe need these strategies the most – teachers. Teachers can and NEED to be happier! Without effective teachers, our future is destined to fail. I know that’s a bit dramatic, but it’s true, so let me explain. I have come to realize that teachers play an even more important role in our society than I thought. Our future leaders are sitting right now in classrooms around the country, and the people responsible for providing them with the necessary skills, abilities and character traits they need to create a hopeful future are our teachers. Teachers are creating our future every day. The problem is that many of our teachers today are not happy. They are overworked, underpaid, frustrated and stressed out, and our kids and future are suffering. Perhaps you know a teacher who has lost his/her enthusiasm, and you see how their unhappiness is affecting their class. If you do, then you know what I’m talking about, and you know why this is something that I’ve made it my life’s mission to change. Our teachers need to teach happier. A happier teacher will be a more effective teacher, and when teachers teach happier, amazing things will happen, and our students and our future will be the beneficiaries. These strategies are designed to show teachers how to not only have a greater impact on the students they care for, but also on the other people in their lives. Click on the link and buy one for yourself and one for that other amazing teacher who needs a little more happiness in his/her life. Teach Happier is available in both paperback and Kindle versions.